We’re not gonna touch on the fact that some lunatic is running around biting dudes’ faces off in Miami, and another one is feasting on a guy’s brain in Maryland. Or that fifteen years later we still can’t get the image of Mike Tyson biting off Evander Holyfield’s ear out of our minds. For all we know, we may be living in a real-life zombiepocalpyse, ripped right from the pages of The Walking Dead. 1) He obviously knows a little somethin’ somethin’. After starring in three Men in Black films, and one of the best summer sci-fi blockbusters of all time, Independence Day, it’s clear Mr. Smith may have picked up a few tips on surviving Armageddon. We can use his advice when we’re fighting off slow-moving ghouls. And anyone who can hunt deer in a red Mustang is a must-have for your inner-circle. 2) He can talk his way out of anything. Seriously. We crack up listening to Smith’s one-liners in his movies and his witty remarks in interviews. But the two-time Academy Award nominee slyly uses idle time in his alien-vanquishing movies to charm invaders into submission before they even know what hit them. 3) He’s always the last one standing. Two-headed extraterrestrials. Liquid-spewing life forms. Nothing is a match for Smith. He even outlived every living being on the planet in I Am Legend. We bet if zombies threatened to take over the planet, he’d probably find a way to duplicate himself to face off against their army. Because he is not going down. Not to mention he’s got a mean backhand. 4) He’s always armed and ready. Whatever defense mechanism some slithery space being has, Smith is toting a bigger—and nastier—weapon, trust. Even the teeny shooter Smith carried in Men in Black had creatures shook. Face it: they’re just not ready for him, y’all. They try to trick him with their shenanigans, but Smith always has a little something for them. 5) He ain’t never scared. If the end of days comes and we’re faced with a bunch of flesh-eating walkers, aliens, or ghouls, you better believe Smith will roll right up to them with whatever gadget, hatchet, or harpoon he has and take them down with no hesitation. He has no time for the foolishness, and won’t be waiting around to be killed. Just ask the brigade of androids he faced off against in I, Robot. This post was previously published by The Urban Daily. Haha! Greast list! 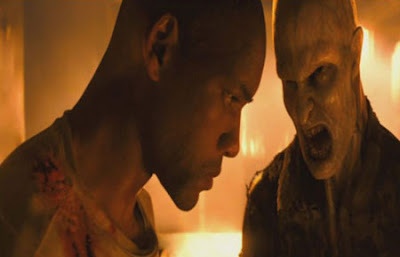 I seriously hated I Am Legend though. He should've talked the director into changing the ending to match the graphic novel.